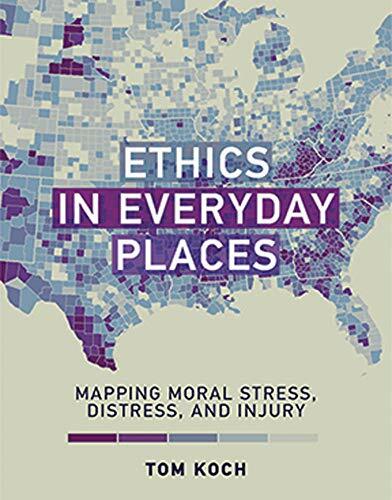 In Ethics in Everyday Places, Tom Koch, a medical geographer and bioethicist, explores what he terms "the mapping of ethics." He begins by examining "moral distress," which arises when an individual agent's moral judgments or sensibilities conflict with his or her social, institutional or professional obligations. Like other professionals – nurses, physicians, social workers – cartographers regularly face such conflicts between what they believe is right and what their positions require of them. Indeed, Koch identifies such challenges as endemic across professional life. Moreover, he maintains, the ethical theories promulgated by purported ethics experts - deontology, consequentialism and virtue ethics – are of little practical use. Too abstract to neatly resolve specific day to day challenges, and too remote in their feigned "Olympian objectivity," these tools he dismisses. In their stead, he proposes a "bottoms up" moral anthropology to locate how and where "moral stress, distress and injury" arise, and how they might be mitigated. Koch focuses on cartographers not only because, methodologically, he advocates beginning with one's immediate professional context, but also because "maps are everywhere," and widely influential in presenting their constituent information quickly and efficiently. Far from static representations of raw data, maps as he understands them are social documents which inherently advance specific world views and webs of values. Maps are effectively, he maintains, moral arguments, and when mapping interrelations among social phenomena such as health and disease, or poverty and educational opportunity, they cannot help but reflect and advance the values of the map maker. To illustrate his point, in chapter three he introduces "the tobacco problem," a thought experiment that he uses when presenting his ideas to large groups. What if, he asks his audience to consider, you are a cartographer, and have been offered a large sum of money by a tobacco company to make a map illustrating, for example, that a statistical majority of long-term smokers – studied nationwide – is still alive at age 65. Statistically, Koch grants, the tobacco company's data may be factually accurate. Yet, you are being asked to organize and visually present data that misleads, for example, that understates other health risks smoking might pose, and that might lead readers to conclude that smoking was not as dangerous as typically posed. You would not be lying, Koch maintains, nor would you be telling the truth. You would be presenting a narrowly construed and socially destructive "false truth" that masks a "broader truth" – presumably, smoking's documented health risks – and that undermines truthfulness as a social good. You would be, in effect, inflicting moral injury upon consumers who drew inaccurate estimations of their own health risks based upon your selectively presented information. Indeed, Koch insists, this type of injury is rife and spans many if not most areas where such social information is graphically organized and visually presented. In chapter seven, for example, he illustrates how standard maps of London's subway system are designed for able bodied travelers, and systematically understate how difficult – and how restricted – travel opportunities are for those with mobility or other physical limitations. In chapter eight, he argues that maps used to demonstrate the broadly egalitarian distribution of donor organs under the United States UNOS system, are similarly misleading: They show how organs are distributed once recipients are placed on the recipient list, but obscure how poverty, geographic distance from major medical centers, or lack of broader access to health care excludes patients from becoming potential donors in the first place. Chapters five and six take similar tacks, attempting to show how maps of relative poverty and lack of educational opportunity systematically understate the inequities they document, capturing, for instance, that large differences in school funding across districts may exist without illustrating what those differences translate into in practical advantages or disadvantages. On these counts, Koch's focus is clear, and illustrates the substantive difficulty not of but with his work. In his preface, Koch relates his response upon reviewing a detailed map documenting the governmentally defined distribution of poverty among counties in the United States: "In its facticity, I wondered, where were its ethics, and why was I not immediately outraged by the map's bald statement that more than one in eight Americans, citizens of my birth country, were living in poverty?" Where, indeed? In the last two chapters of his book, Koch laments that professionals – including, presumably, the cartographers who generated this map, are trained to ignore their own moral sensibilities and the social impact of their work, in favor of "depoliticized speech" and "a kind of blinkered agnosticism." As an alternative, he proposes his "moral anthropology," which eschews abstract ethical theory – of which, he freely voices his suspicions, and instead aims to address the evident conflict between "thinly principled value declarations," for example to equality, or equity, or justice, and the "thick realities" that ostensibly fall short of those ideals. Yet how do we know – even granted maps like that referenced here – that we are falling short of those ideals? Koch, notably, does not hold that information presented in visual and graphical forms is inherently selective or limited, partial snapshots of complex social realities. He instead insists much more broadly that there is no truth in any substantive sense, that there are no "Olympian" observers to identify it, and that all knowledge claims depend upon the personal experiences and perspective and social situation of the claimant. If that is the case, however, how could any map be more or less truthful then any another, or more or less revealing of social reality? More pointedly, how could any map illustrate a failure of "thick social realities" to comply with "thinly principled value declaration?" In addressing this issue, Koch's arguments consistently take the same form – 'If we want a society that is X (typically equitable or just), then we must do Y, or Z.' How do we know we do – or should – want X? Because Koch says so. More importantly, how could a map maker's presentation of statistical data lead one to draw such a normative conclusion, or even believe more broadly that a map maker's primary aim is – properly – to advance such moral conclusions? If Koch's denial of any substantive truth is correct, then no conclusion on any reader's part should follow from the data presented: There is no reason why two people viewing the same poverty map he describes should believe anything apart from what their individual experiences, perspectives and social situation lead them to: Outrage, indifference, or approval would all be equally legitimate responses. At the same time, if the proper response to the maps he describes is some species of moral outrage, then those documents would presumably encapsulate injustices that "we" all agree are thus identified. That there is no such broad agreement underscores the failure of each of Koch's "If-then" arguments to gain the traction he wishes. Worse, it reduces all map makers – not only the ones he does not agree with – to propagandists. The book begins from an interesting, novel premise, that of mapping moral fault lines. It provides an interesting account of how maps are made, and how map makers work. Its primary points about the selectivity with which statistical information is presented, however, are hardly new or insightful, and serve only to advance a political agenda for which the author does not argue. The authors' normative ideals are less supported than asserted, and the book presupposes the conclusions it aims to advance. Its treatment of standard ethical theories – particularly in chapter two – is sloppy at best and seriously misleading at worst. It will likely appeal to general readers who share the author's political convictions, but not to those who do not. Occasional lapses into jargon are rare, and the book is eminently readable, and presents interesting illustrations of map making and graphical information presentation. Ultimately, however, it falls short of its opening promise, offering no new insight despite the author's distinctive expertise, and adding little to the very timely national discussion concerning the political dimensions of information dissemination.